This hotel lies in the centre of Munich, a 3-minute walk from Munich Main Station. The family-run Hotel Cristal offers spacious rooms, à la carte dining and a parking garage. The modern rooms at Hotel Cristal include a flat-screen TV, minibar and a private bathroom. 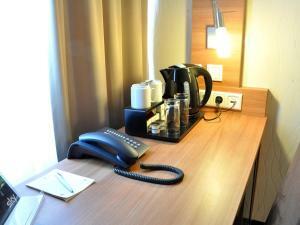 Broadband internet and Wi-Fi are available in the whole hotel. A rich breakfast buffet is provided from 07:00 to 11:00 each morning in the Hotel Cristal. 1912 Restaurant & Bar offers Mediterranean cuisine and the bistro bar serves wines, cocktails and snacks. The Hotel Cristal is a 5-minute walk from the Theresienwiese beer festival location, and the shopping and pedestrian area at Karlsplatz. Guests enjoy good underground and S-Bahn (city rail) connections from nearby Munich Main Station. It is only 25 minutes to the Allianz Arena, and 40 minutes to the Munich Exhibition Centre or Munich Airport. Please note that if the amount of the booking is more than € 500 the property will charge 50% of the total amount once the booking is confirmed.